Tony Thurmond was sworn in as the 28th California State Superintendent of Public Instruction on January 7, 2019. 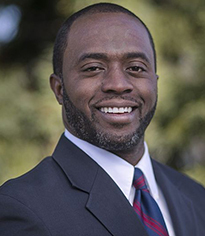 Superintendent Thurmond is an educator, social worker, and public school parent, who has served the people of California for more than ten years in elected office. Previously, Superintendent Thurmond served on the Richmond City Council, West Contra Costa Unified School Board, and in the California State Assembly, representing District 15. Like many of California’s public school students, Superintendent Thurmond came from humble beginnings. His mother was an immigrant from Panama who came to San Jose, California, to be a teacher. His father was a soldier who didn’t return to his family after the Vietnam War. Superintendent Thurmond met him for the first time when he was an adult. After Superintendent Thurmond’s mother died when he was 6, he and his brother were raised by a cousin who they had never met. Superintendent Thurmond’s family relied on public assistance programs and great public schools to get out of poverty. Superintendent Thurmond’s public school education allowed him to attend Temple University, where he became student body president. He went on to earn dual master's degrees in Law and Social Policy and Social Work (MSW) from Bryn Mawr College and began a career dedicated to service. Much of Superintendent Thurmond’s social service work has focused on improving the services provided to foster youth and directing programs that provide job training to at-risk youth. He also led programs to provide help for individuals with developmental disabilities. Tony has 12 years of direct experience in education, teaching life skills classes, after-school programs, and career training. Superintendent Thurmond served on the Richmond City Council from 2005-2008. While on the council he served as Liaison to Richmond’s Youth Commission and Workforce Investment Board and the Council Liaison to the West Contra Costa Unified School District. He was chair of Richmond's 2005 Summer Youth Program which employed 200 local teens. Superintendent Thurmond served from 2008-2012 on the West Contra Costa School Board, where he coordinated a plan to keep schools open during the 2008 recession. Superintendent Thurmond helped restore fiscal solvency and local control to the School Board, while supporting campaigns to put millions of dollars toward preserving counseling, after-school, music, and athletic programs. Under Superintendent Thurmond’s leadership, the School Board rebuilt dozens of schools to provide state-of-the-art student learning facilities. Superintendent Thurmond funded programs to help students learn about and apply to top universities. He also led efforts to expand drug and alcohol treatment services for youth, and to bring nutrition and wellness programs to schools. Additionally, Superintendent Thurmond spearheaded a campaign that reduced school suspensions by 27%. In the State Assembly, Superintendent Thurmond served on the Assembly Education, Health, and Human Services Committees. He chaired the Assembly Labor Committee and the Assembly Select Committee on Science, Technology, Engineering and Math (STEM) Education. Education is at the core of Superintendent Thurmond’s legislative record. He authored legislation that successfully expanded the free lunch program, bilingual education, and the Chafee Grant college scholarship program for foster youth. Additionally, Superintendent Thurmond’s legislation guaranteed preferential voting rights for student school board members, improved access to families for early education and childcare, and shifted millions of dollars directly from prisons to schools. Superintendent Thurmond introduced legislation to expand STEM education, improve school conditions for LGBTQ youth, and tax private prisons to fund early education and afterschool programs. In recognition of his social service leadership, Superintendent Thurmond has been a Fellow in the Annie E. Casey Foundation’s Children and Family Fellowship program. Superintendent Thurmond lives in Richmond with his two daughters who attend local public schools. They are his inspiration and a constant reminder about the promise of our neighborhood schools and the strong future that every child deserves. Recorded webcast of the inauguration of the State Superintendent of Public Instruction, Tony Thurmond.